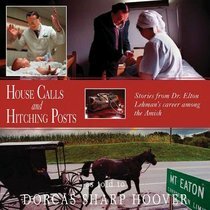 About "House Calls and Hitching Posts"
Dorcas Sharp Hoover, a former school teacher, lives with her family in Dover, Ohio, a short drive from what is known as &ldquo;Amish country.&rdquo; Dorcas is married to Jerry, pastor and businessman. They have six children ages five to 19. Dr. Elton Lehman delivered four of the Hoovers&rsquo; six children in the birthing center he designed. At every delivery, he always had a new story to tell. Jerry Hoover would say, &ldquo;Dr. Lehman, you need to write a book!&rdquo; Dr. Lehman would reply, &ldquo;Yes, but I&rsquo;m not a writer.&rdquo; And then, Dr. Lehman asked Dorcas if she would write his story. House Calls and Hitching Posts is Dorcas&rsquo; fourth book.